As fairytale as it would be to say the first hit in Miller Park was a homer clubbed by a Brewers player, the first hit honor went to Sean Casey of the Reds. He had a base hit to center about ten minutes after the first pitch. The Brewers did hit homers in the game – the first coming from outfielder Jeromy Burnitz in the sixth inning off reliever Scott Sullivan. First baseman Richie Sexon hit a solo homer in the bottom of the eighth inning to put the Brewers on top 5-4, and David Weather collected a save. The hometown fans had much more to cheer about besides the ceremonial first pitches from Commissioner Bud Selig and President George W. Bush to Manager Davey Lopes. A good friend was taking his wife and her parents to MP game #2, but unfortunately her father had to work and couldn’t attend – which turned out to be fortunate for me. It took about two seconds for me to accept an invitation to take his place! The best part was that my buddy got the tickets through his boss at work and they were ABSOLUTELY FREE! We tailgated just like in the days of County Stadium. I don’t think you’ve lived until you’ve experienced the sights, smells, and sounds of grilling with countless other like-minded folks nearby. We went with our traditional beer brats that day – not the fake pre-soaked “beer brats” – but the ones we boiled in beer ahead of time. After polishing off a couple of those babies and several slices of real Wisconsin cheese, we were more than ready to go inside and check out the new digs. Just walking up to the stadium was an experience in and of itself. County Stadium had that old gray metal exterior that felt comfortable, but Miller Park was a big WOW! The combination of bricks and glass, plus a clock tower and huge Miller Park logo were an incredible sight. We talked about how it felt modern yet retro at the same time. The interior was amazing as well. We never felt like we were very far away from concessions or a bathroom. And the place had an actual fan store besides the occasional memorabilia stand. And a restaurant beyond the left field wall. And some cool looking group areas (at least from the outside). I recall being in awe of the video scoreboard – at 76 feet by 32 feet it was hard not to miss! Our tickets were in the Terrace level on the first base side, and we absolutely loved every minute of the game. The roof was closed and that made it LOUD inside. We were treated to a great pitching performance by starter Jamey Wright backed by splendid offense. We didn’t get to see any dingers, but Ronnie Belliard collected a couple of doubles and the Crew drew six walks. Even though the Brewers left an unincorporated town on the bases (10), they still managed some timely hits and won 6-1. We wandered around after the game, still overwhelmed by everything we saw. When I took Dad a couple weeks later, he also found himself in awe of the new park. We witnessed a Brewers victory in a slugfest, 12-8. We heard that if we hung around afterward, we’d get to see the roof open. About 15 minutes after the game we got to witness a mass of steel slowly pull back and reveal the sky to Strauss’ “Also Sprach Zarathrustra”. Dad said it was one of the neatest things he had ever seen in his life – and Dad saw a lot of cool stuff over the years, so I know he was blown away. A lot of people remember the 2001 Brewers as a pretty crummy team, with not much pitching and a lot of strikeouts on offense. They did finish 68-94, after all. But they did tear it up those first couple of months, and were actually 28-24 by the end of May. 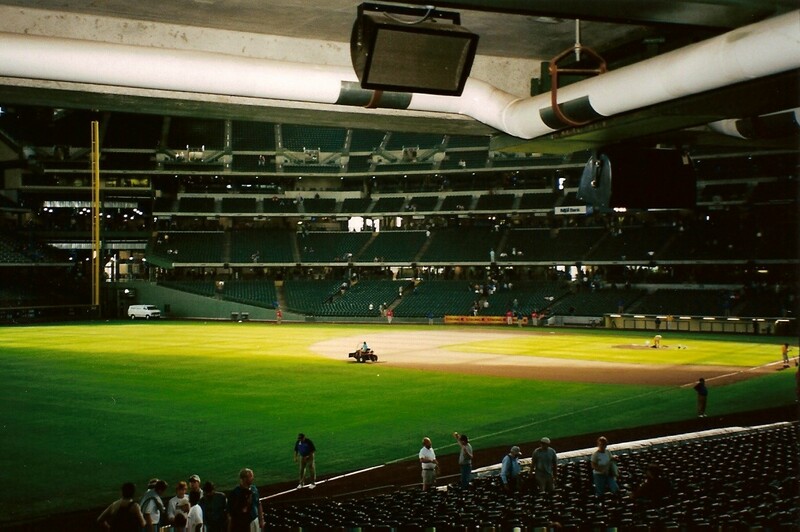 But what I do remember fondly, as I’m sure many of you do as well, those first trips to an incredible new ballpark.